I drove down to Seminole Canyon from Granbury (SW of Fort Worth), leaving before dawn on the 3rd. I arrived, checked in, and did a bit of birding while I waited for the sun to drop a bit. Noontime light is lousy for landscape photos. I was rewarded with a flock of pyrrhuloxias (but never got a photo of them - twice I've seen them in my life, and twice I never got a photo), Say's Phoebes (a lifer for me), a female Lark Bunting (another lifer), Song Sparrows everywhere (also lifer), plus a bunch of Mockingbirds and White-Crowned Sparrows (females only, never saw a male). I set out on the trail toward the Rio Grande around 2:30p with a light daypack. The hike was gorgeous and the light was timed just right to cast some nice shadows on the canyon. I took my time, enjoying the relatively flat terrain and ample birding. I saw my second Loggerhead Shrike of my life and saw a Double-Crested Cormorant on the river (they are common in the winter where I live on Lake Granbury). The hike was fun. I did the full loop and almost took too long. The sun dropped behind the hills with a couple of miles left to go, but that was a happy accident. With only half a mile to go, I stumbled on a small sounder of Javelinas. There were at least 3 adults and two piglets. I got good photos of one adult. The others ducked just deep enough into the brush that I barely saw them. The next day I got up and did a bit more birding but didn't see any new species. I did the tour of the Fate-Bell Shelter to see the pictographs and that was amazing. If you go to Seminole and don't do the tour, you wasted the trip. After the tour I headed for BBRSP but my car decided to see if it could scare the crap outta me. About 10 miles west of SCSP, my car stared getting really fussy. I drive a 5-speed '04 Honda Element. I was tooling along just fine at 75mph when I lost RPMs. The engine didn't quit but it refused to get above 1,500 RPM. At highway speed she usually sits around 3,500. I check my phone - yup, no service. Desert highway, middle of nowhere, no cell service, and my car's acting like she's going to die any second. I beg the car. I plead with the car. I ask the car really nicely what's wrong. No answer. I'm bouncing back and forth almost randomly between 3rd and 5th gear to try and keep going, all the while rolling along on the shoulder with the hazards on. I stumbled through Dryden HOPING I can find help, nada, then continued on to Sanderson hoping that my ride will get me there. I made it to Sanderson and rolled into the gas station there. I asked about a mechanic in town and I get a shrug and a comment that "the old tire place has a mechanic, I think...". The tire place was shut tight, nobody home. I get back into the car and hope I can limp into Marathon or Alpine worst case, assuming my trip was done. I decided to take my chances and headed for Barton-Warnock. I've heard a lot of good things about the Rangers there but I must have come at a bad time. I wanted to ask questions but, since it was 3:30p and I wasn't going into the backcountry into until the next day, so they pretty much just wanted to give me a campsite and deal with me tomorrow. There was a second ranger at the desk who answered a few questions and offered tips but he was clearly on his way out the door. Even so, he was far more helpful than the grumpy dude. I camped at Grassy Meadows that night. I was there when they opened at 8a (okay, they actually opened at 8:09a, but who's counting?). The same ranger who had been short with me the afternoon before was at the desk. I was trying to get a feel for what to expect on a hike from Contrabando up past Fresno Cascades. Even though it as just he and I at the time, he seemed like he just wanted to do the permit and move on. Not what I would expect from a Ranger at a park as untamed as BBRSP. I started on the west Dome trail. The hike was what I expected, mostly. Open desert, no cover. I forgot my sunscreen and got a nice burn for my trouble. I started my hike around 9:30a and arrived at the old mining complex around 2:30p (around 6 1/2 miles). I was concerned that my pace was a little slow for such flat terrain, around 1.3mph. My pack was still too damn heavy but I also stopped a LOT to take photos (I took 1500 photos in 6 days). I gave myself an hour off at the mining complex to eat lunch, rest, and explore. I headed for the Fresno Cascades but I missed the cairn indicating where to leave the arroyo. On the one hand, it made my walk longer, but on the other hand I found water I didn't expect. It wasn't deep but it was a clear flow. I should have topped off but I didn't - rookie mistake. I stopped for the night at the base of the Cascades. The huge slabs of aggregate rock were a pretty clear indication I was where I wanted to be. I unpacked and set up for the night and realized I'd consumed 3 of my 4 liters of water. I debated if I should backtrack to the water I'd seen (about a mile) or just conserve knowing there was guaranteed water at the Crawford-Smith House about 2 miles further up the canyon. The hike up the canyon was fun and I got a few more birds for my list; a Canyon Towhee (my first in TX, saw a bunch near Santa Fe in '15), a Black-Tailed Gnatcatcher (my first), a Rufous-Crowned Sparrow (also my first), and only my second Yellow-Rumped Warbler. I think I saw a Curve-Billed Thrasher as well. That would be a lifer but I'm not sure enough that's what it was. I skipped hot food, since it would require using water. Instead I ate jerky, trail mix, and gummie bears for dinner. I allowed myself to have half a liter of water and saved the other half for the hike to Crawford-Smith. I bedded down with my tent in the soft gravel of the arroyo. During the night, I had a visitor. I wasn't sleeping well (didn't sleep well all trip - will explain at the end) so I heard footsteps approaching in the gravel. I knew it was something small so I was excited rather than afraid. It approached slowly and it got very close to the tent. I was holding my breath so I didn't spook it. Then I heard a distinct pig grunt and it wandered off. Javelinas became my spirit animal on that trip. When my wife asked if there was one "best moment" of the trip, that was it. The next morning I awoke just before dawn with diarrhea. Great. The diarrhea didn't ease up so I skipped breakfast and nursed the remaining half liter of water, wanting to conserve until I knew I had a source plus I was afraid it would be wasted going right back out the other end. Desert + diarrhea - water = dead so I packed the lightest daypack I dared and headed for the water. A two mile hike took 3 and a half hours because of the constant stopping to soil the canyon. The hike would have been shorter had I found the trail cairn (it was less than 50' from my tent!) but the following the canyon wasn't much further, just a harder hike because of the soft surface. By the time I reached the water, I decided I was done. I filled 4 liters, drank a liter, then refilled the water to the top. I added some electrolyte solution/orange flavor to my hydration pack just in case. I had to stop once while refilling the water to purge but thankfully that was the last (though I didn't know it at the time). I hiked back to my tent, my mood going from annoyed that the diarrhea scare was making me quit and really kicking myself to happy that the diarrhea was easing back and I was enjoying the hike for the first time all day. All the way back to the tent I flip-flopped between heading back to the car and trying some of the dayhikes I had wanted to do. Though I hated myself, I decided the better option was to head back. I didn't know what the problem was with my gut and figured it was the best move. Part of me is still upset at the decision. I started back, guessing that I may not make it back to the car by dark and debating if I was going to hike through the darkness or spend another night in the backcountry. I figured I'd let distance to the car come nightfall decide for me. Based on a comment the helpful ranger made, I decided not to follow Fresno Divide or Dome west back to the car. He had mentioned that there was always water in Fresno Creek, which parallels the Fresno Divide, albeit in an arroyo with 40-60' high walls. Looking at the map, it looked like a good option since it cut distance as well. I figured if I needed to spend another night +/- a return of the illness, being near water was probably not a bad idea. This was actually a GREAT decision. Fresno Creek between roughly 170 and the Whit-Roy Mine was the prettiest thing I saw in my entire 6 day trip. The canyon is gorgeous! The only trouble is that there is only one way in or out at the southern end of the canyon if you want out before 170. If I hadn't had a topo map, i never would have found it. It required a rock scramble up a steep slope but only about 10' high. I was loosing the light but I knew I was close enough to make it back to the car by dark, or soon after. The Ranger was right, water was everywhere. There were even a few pools that were washtub deep. Along the way I got my only injury of the trip. I had to bushwhack from the creek to the marked trail and i encountered a 6' ravine. While looking for a reasonable way across, one of my trekking poles caught on something and I fell forward. It was one of those "time slows down" moments. I saw I had two choices - try and keep my feet and risk going into a trio of cholla and maybe into the ravine as well or go down as quick as possible and hope for the best. I went with the latter. I hit the gravel and scraped up one knee, one shoulder and a pretty good bruise on my hip, but I missed the cholla - by inches. The shoulder ached for about 2 days but not so bad that Tylenol couldn't handle it. I dumped my gear in the car, grabbed my tent, and slept at the campsite at the trailhead. I was told it was "unofficially" a campsite that they tried to save for folks like me - folks coming off the trail late. I checked in with Barton-Warnock the next morning and gave myself an easy day. I hiked Closed Canyon & Hoodoos and took my time driving 170 west and stopped for tons of photos. I decided to skip Ranchieras this time owing to the heavy pack and sleeping problems. I headed to the interior. The folks at Sauceda restored my faith in the rangers. They were incredibly welcoming and informative. There was a volunteer there than I think has hiked every trail in the park and could tell you a dozen routes that should be trails. As I chatted, I scribbled notes on my park map. She gave me hike ideas I'll be using at my next visit. I booked a site at South Leyva (a ten-site camp that I had all to myself for two nights) and then backtracked to Ojito Adentros. I got to the "oasis" at just the right time. The evening light was gorgeous and I got another lifer bird, a Black Phoebe. In fact, there were half a dozen. On the advice of the awesome volunteer at the ranger station, I spent the next day on a long, exhausting hike but it was awesome. I started at the Puerta Chillicote trailhead and headed for the Fresno Peak Overlook. It was a pretty level hike until the last bit and the view of the peak was gorgeous. The official trail stops there but there are cairns that lead further south that are worth following. They descend slowly to what looks to be a steep dropoff into a side canyon. The last 50 yards or so are wall-to-wall Resurrection Plants. I backtracked to the main trail and headed toward Mexicano Falls. The trail has some steep and seemingly rarely used sections, especially the last drop down into Fresno Canyon. If it weren't for the cairns, I would have been certain I was off-trail. I did have one slide which got my hand and arm loaded up with a bunch of an interesting agave-ish spines that were bright yellow and really wide but didn't go in deep. One of them slid in so smooth and painless I didn't find it until the next day. This was a really long hike. The GPS said 15 miles. I made it back to the car right at dark, exhausted. I don't recall the elevation gain but AllTrails says ~2400 feet. I went back to South Leyva for the night. On my way, I met my friends again - a mama Javelina and her piglet. The final day was a short one. I attempted to sleep in but nature's call woke me, thankfully. I was only half awake while watering the desert but I glanced at the pre-sunrise sky and saw amazing pinks and purples forming. I grabbed my camera and it on automatic. I shot a photo every 20 seconds for the next hour and it was spectacular. I made it into a gif I'd love to share here if I can figure out how. I spent the last morning hiking the Cinco Tinajas trail and exploring the interior in my car on any roads my car could drive then returned home. 1) My pack is still too heavy. I've got to ditch that heavy 4lb bulky sleeping bag. Honestly, its not wide enough anyway. I'm a big dude, 6'2", around 235, and my shoulders are too wide for me to turn over with it still zipped. I also, as most rookies do, carried too much food. I had the right amount of breakfast and dinner but I brought about 4x as much lunch/snacks as I should have. I should probably do something about the tent as well. It's 3.5lbs and bulky but I need to prioritize the budget - sleeping bag and a new pad first. 2) I cannot sleep comfortably in my tent. I'm a side-sleeper and my shoulders and hips ached all night, every night, my lower back most nights. Even wearing two wicking t-shirts, a hoodie, and the pad, and the sleeping bag, I still hurt at the hips and shoulders. If I can shrink the bag, maybe I can carry a yoga mat or a thin foam pad to supplement and upgrade my pad. If your picture is less than 400 kb, you can just attach it to your post (i.e. click on "Additional Options..."; click "Preview" first if you're entering a reply). Note: due to the almost-full nature of the file server area used to store attachments, this method is discouraged for all but the smallest image files. Also, a large number of attachments have been lost in the last couple of host server transitions, so it is not to be considered reliable. Also, the attachment feature was not really intended for images, although it can handle them. It may be the quickest way to post a photo, but it is certainly not the best method. If you'd prefer to have more than 4 images per post or would rather have them embedded in your post, then you'll need to use the "Insert Image" (e.g. [img][/img]) feature and paste in the URL to your image file's location on the internet. If you don't have it somewhere online, you can store it at http://www.bigbendgallery.com/uploads/. Just be sure to use a unique filename so you don't overwrite someone else's file. We'd appreciate it if you kept the file size down, but if you don't, your friendly neighborhood Moderator will eventually come along and resize it for you. There are lots of free online photo hosting sites (photobucket, flickr, etc) that will allow you to retain control over your image file. There are also several free hosting sites that do not require any registration (my current favorite is imgur) that will keep your file around as long as it is being viewed somewhat regularly. 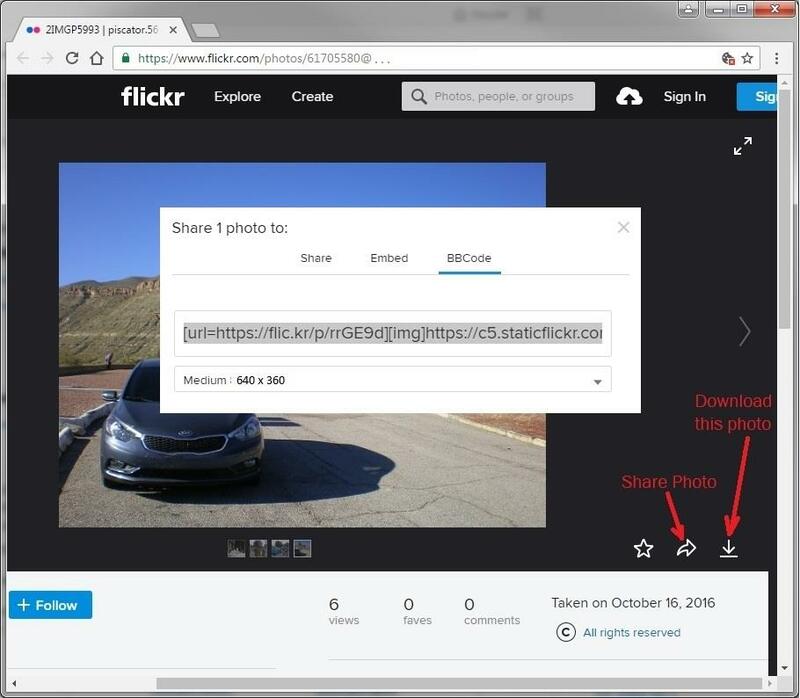 Once you have your file online somewhere, make sure you paste only the valid URL inside the image tags (i.e. [img][/img]). If your URL isn't to the actual file, it won't work. The last "word" after the last "/" should be a filename like "filename.jpg". Unfortunately bigbendgallery.com has been having server issues and is inoperable for uploads. Flickr is a great option for long-term storage. Imgur.com is easy and you don't have to create an account. It's not my favorite because it's blocked by my work IP. Bottom line is if you want to embed them, you have to get them online first. That is a GREAT trip report, Losthiker. And a GREAT trip. I’d say you really got a lotta bang for your buck. The trip certainly didn’t lack for adventure and excitement. I can’t tell you how many trips like that I had in my first decade or so of solo backpacking. Even today, I’d have made the same decision you did when faced with unexplained diarrhea. What doesn’t kill you, makes you stronger: builds confidence and instills wisdom. Sounds like you handled it all like a champ, made some bold moves, and have a good grasp on what to work on next. As far as sleep comfort, especially for side sleepers, my advice is invest in a state-of-the-art ultralight inflatable pad like a NeoAir, and pair it with a closed-cell foam groundpad to protect it from thorns and other sharps. Good luck on future trips, and I hope to see some of your photo handiwork soon! Does your medical bag contain diarrhea medicine? I bet it does now. Always include Benadryl, just in case you get stung by something too. Check out the Air rail sleeping pad at REI https://www.rei.com/product/845298/rei-co-op-airrail-15-self-inflating-sleeping-pad This pad is MUCH quieter that the neo pad. Did the Check Engine light come on when the car was acting up? Get it scanned if it did, because it may have been stored a code so you can address the problem. If no light, it was most likely fuel or fuel pressure. Were you low on gas? If the fuel pump is getting tired, it will heat up more when not submerged with gas and may start giving you pressure problems. Could be weak too and may need to be replaced. I'm pretty sure the pressure is easy to check on a honda. If it is out of spec by only 1 psi, replace it. Tough lesson to learn, but when you are at water in the desert, always drink what you have in your bottle, then pump some more. The desert is not the place to wain the body off water. Thanks for the report. Did you see/hear the herd of Burros? It already has Benadryl. I used to work in wildlife management and know what Africanized bees can do. I've been attacked twice. I had plenty of gas. I was paranoid and never let her get below half a tank. The check engine light is on 24/7 but the mechanic I use says no codes are being reported. Actually, you reminded me that I forgot something amazing. On the way back to the tent after getting water, I heard what I thought was burros but I dismissed it until I came over a rise and saw a herd of them. 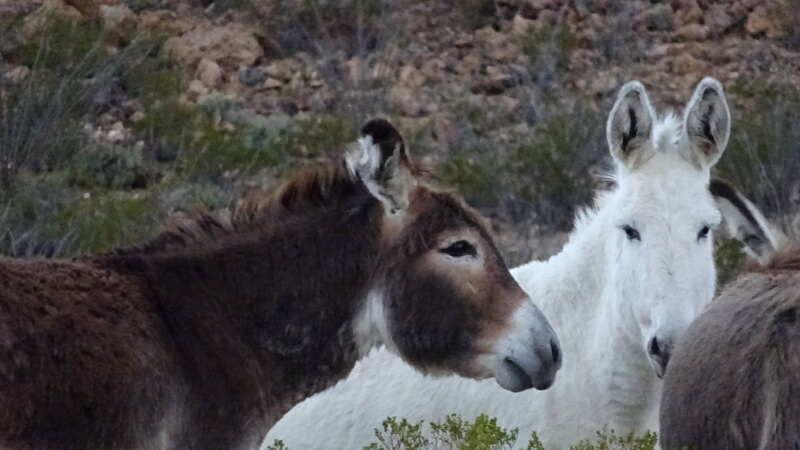 Smack dab in the middle of the herd was a solid white burro. They were far enough away and camouflaged enough that I might not have seen them had the white one not been there. I was told there are roughly 3 small herds that wander that part of the park. The rangers had never heard of the white one. Great photos, Losthiker! They really do show the BBRSP terrain, which is in many ways a lot rougher than most of BBNP. Nice wildlife shots, too. Txlj may be right about your having created a new legend - The White Burro. I suspect people will be looking for it now! Haha! Elhombre's totally on to something there. I don't use a NeoAir, but on those rare occasions that wife goes backpacking with me, she borrows my brother's old NeoAir, and it's mighty comfy, but - MAN!!! - it is noisy. Every time she shifts her weight or position, it sounds like a dying animal or a bad fart. My kids used to accuse her of bad gas until she demonstrated the pad noises in daylight. Now, given that she and I are practically deaf in our elder years, we don't mind. But the kids can't stand it. Maybe better to go with the Air Rail. We did a 5 nighter at the end of Christmas break. Those burros party all night long! Kept us up most of the night when we were camped above Fresno Cascade. Thanks. I carry a DSLR camera (Pentax K-50) and two lenses, a 28mm wide angle for landscape and low light shots and a 300mm for wildlife photos. I wear a fanny pack to carry the spare lens for quick swap-outs. I also carry a tripod for long exposure and sequential shots. The white burro was near the bend at roughly 29.362, -103.846, I think. This was on the return trip from fetching water when my gut was still deciding if it was going to behave. The photo with the small shack was near the burros. That would be in the right area. Did you see the shack I have in my photos? 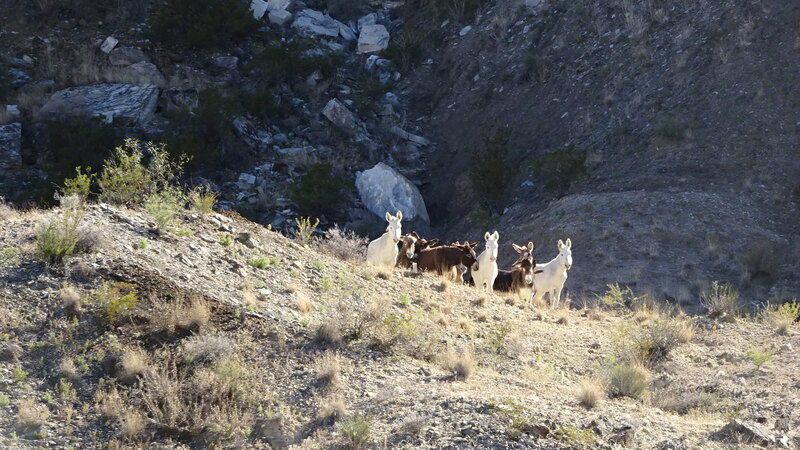 The herd I saw was maybe a 15-20 minute walk below that shack near the sharp bend in the arroyo. I love the shot, "Sunrise at South Leyva" (the non-gif). If it were calendar nomination time, it would get my vote. Thanks. My wife is a graphic artist and she wants to play with it. She thinks she can get a little more out of the foreground.